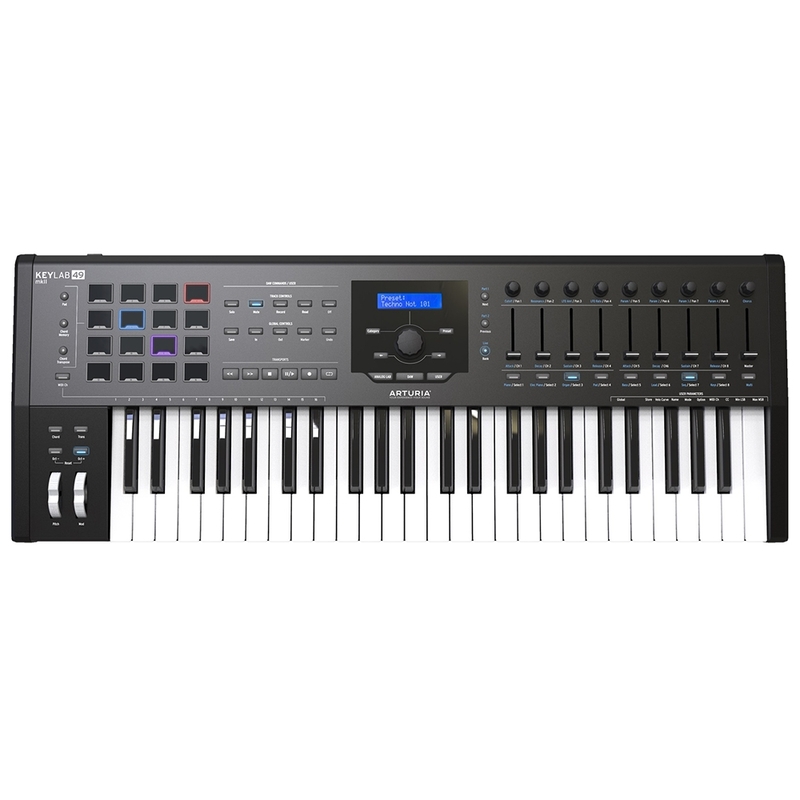 Arturia's premier MIDI controller, KeyLab MkII represents a quantum leap in terms of control, quality, and expression. 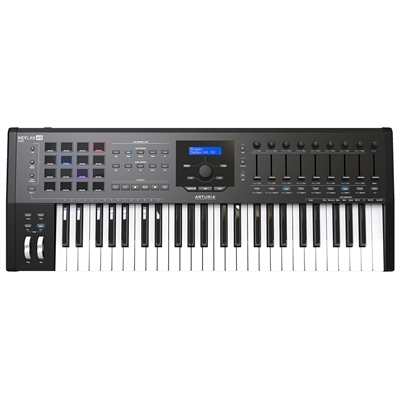 Featuring a responsive keyboard action with 49-keys, aluminium chassis, advanced configurable interface, 16 RGB backlit performance pads, 9 large faders, 9 rotary encoders, 5 expression control inputs, 4 CV outputs, smart category controls, and - of course - MIDI and USB connectivity. Included is an impressive software bundle: Arturia's complete Piano V virtual piano instrument, Analog Lab 3, and Ableton Live Lite. Premium software included: every version of KeyLab MkII comes complete with inspiring software instruments, including Arturia's venerable physically modelled piano studio Piano V, the inspiring preset collection Analog Lab, and Ableton Live Lite. No other controller comes close. Luxury keyboard: sporting the same opulent synth keybed as Arturia's flagship MatrixBrute, KeyLab MkII lets keyboard players truly express themselves with 49-notes. Modular connectivity: hook up to external synths and modules using CV pitch, gate, and 2 modulation controls. 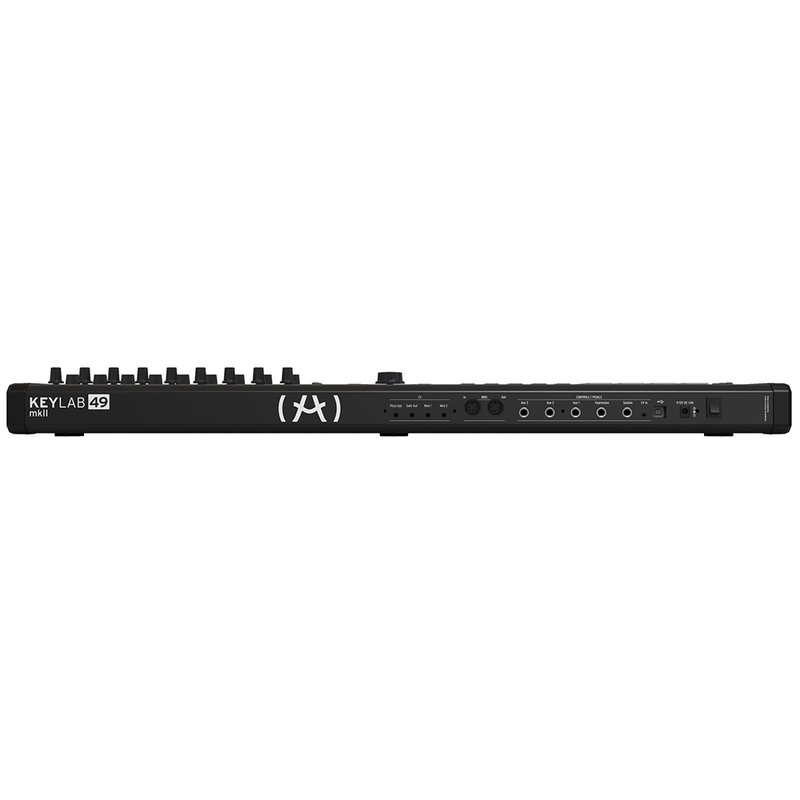 Configurable inputs: this full-featured controller not only features sustain and expression inputs, but also 3 configurable aux inputs for total creative control over your sound, both on stage and in the studio. 16 Pads: multi-function RGB performance pads not only let you accurately capture percussive playing, but also play pre-programmed chords, and easily switch control maps. Tactile controls: 9 large faders and 9 rotary knobs give you full control over your DAW projects and also your instrument and effect parameters thanks to intelligent mapping. Total integration: KeyLab MkII gives unfettered access to every element of Arturia's own software instruments. The ideal controller for V Collection owners. DAW control with magnetic overlays: with KeyLab MkII, you never need to guess if you're hitting the right button. Magnetic overlays for the 10 most popular DAWs are provided so you can use all 16 transport controls for maximum effect. Luxury build: housed in a glorious aluminium chassis, capped with real wood side panels, and featuring the same gorgeous machined aluminium mod and pitch bend wheels as the MiniBrute 2, KeyLab MkII adds a touch of class to any studio setting.